St Andrews aims to enrich the everyday lives of people living with dementia in our home and in the community. We seek to offer optimism, enthusiasm, appreciation, and love, creating the best opportunities for supporting people with dementia so that they might grow and thrive socially and emotionally. We focus on a person-centred approach and the uniqueness of the individual, their history, their relationships and what is important to them. 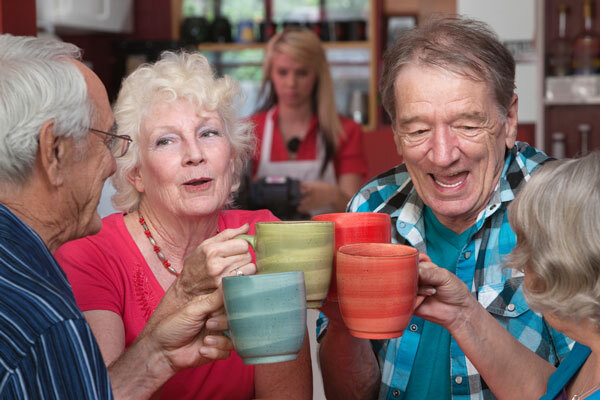 Residents are encouraged and supported to participate in activities of interest to them which stimulates senses, pleasurable memories and their community involvement. “Doing for one’s self” is an important endeavour to provide therapeutic benefits. Residents are encouraged to be involved in daily tasks that they may have done consistently throughout their lives in their own homes. This offers an opportunity to promote feelings of worth, contribution and an opportunity to reminisce informally. Continual assessment identifies the individual needs of residents on a daily basis. St Andrews provides for the aged care needs of people living with dementia. Our residential care facilities are able to assist people living with early to moderate dementia or Alzheimer’s disease. The areas within our residential care facilities have been designed to provide a home-like atmosphere with single rooms, ensuites, dining rooms, activities rooms, sitting rooms, elevated gardens, internal courtyards and safe walking paths.